We are so happy to announce that Chef Phil Verden, his lovely wife Amy, and big brother Finn have just welcomed little Kitt Rowan Verden to the world. Mother and son are doing great! Last year we were runners-up in the Somerset Life Restaurant of the Year Award (without knowing anything about the competition). This year we would love to win it - if you feel like nominating us that would be fantastic - you can vote online here. My staff at Clavelshay are certainly a talented bunch. 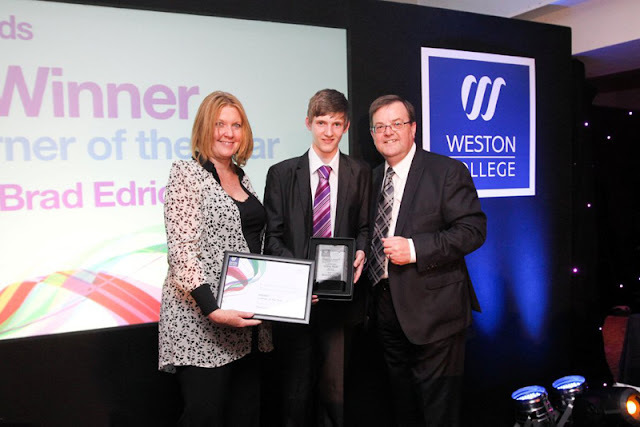 Our boy, assistant chef, Brad Edrich won the Weston College's Catering/Hospitality Learner of the year and overall Learner of the Year - I'm very proud! Welcome to Clavelshays new blog.. Welcome to Clavelshay Barns first new blog post. I am intending to keep you updated on all new events and news as it happens. Don't the staff look smart in our new uniforms!